Each day, the Fairies and the Dreamer score points for each Element the Dreamer identified correctly. The Boogeymen score points each time the Dreamer is incorrect. The Sandmen score extra points when the Fairies and the Boogeymen score the same number of points. Place the board in the center of the table. 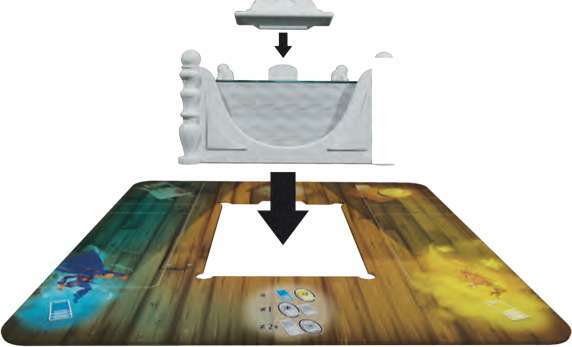 Place the bed in the center of the board. 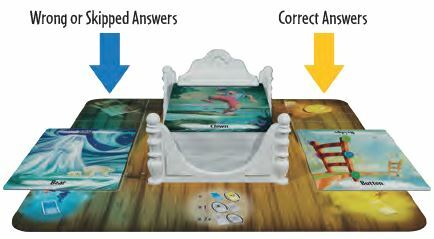 Since the Dream Cards are double-sided, shuffle them thoroughly (by rotating and/ or flipping them) and place them on the Bed. Place the Headboard to cover one of the two Elements. Covered Elements are not used during the game. Place the sand timer and the Point tokens within reach of all players. Depending on the number of players, take the corresponding Dream Spirit cards and leave the rest in the box (they will not be used during the game). The oldest player becomes the Dreamer for the first round. They take the sleep mask and place it in front of themselves. The Dreamer shuffles the Dream Spirit cards and deals one to each player beside themselves. Each player looks at their card without revealing it to the other players. The remaining card is placed facedown on the table and must not be revealed. Then, the Dreamer covers their eyes with the sleep mask. Place the top Dream card at the bottom of the deck (making sure to rotate or flip it) to reveal the next Element. 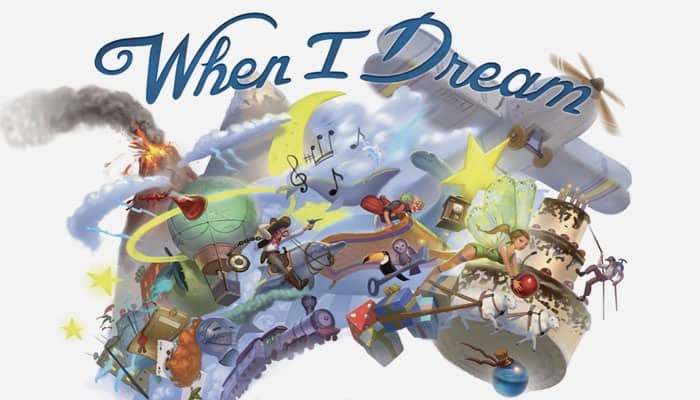 Starting with the player to the left of the Dreamer and going clockwise, each player gives a single-word clue to describe the Element. Proceed this way until the Dreamer interrupts to guess the Element. As a result, it is possible for multiple turns to go around the table. The players cannot give clues that are derived from the Element, or clues that sound similar, or even translate the Element into another language. If the Dreamer is correct, the card is placed on the Yellow of the board. If the Dreamer is incorrect, the card is placed on the Blue side. 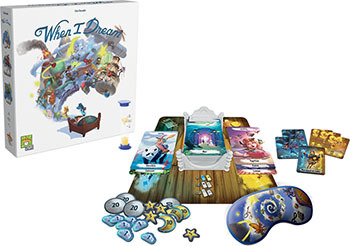 Then, players resume taking turns and proceed with the newly revealed Dream card. Important: The Dreamer cannot know whether their answer was right or wrong. Players must remain discreet! When the two minutes are over, the Dreamer may give one last answer (this is not mandatory). If they decide not to, the last card remains on top of the deck, with no effect. If the Dreamer is confused and has no ideas, they can skip the current card by saying: "Pass". The card is then placed on the Blue side of the board. If a player cannot find a good clue, they can skip their turn by saying: "Pass". If a player takes more than 5 seconds to give their clue, their turn is automatically skipped. If a player gives an improper clue, the current Dream card is placed in front of that player as a penalty. It will reduce their score by one point at the end of the game. Proceed with the newly revealed card but make sure that the Dreamer knows that the Dream card has changed. When placing cards on the board, make sure to spread the cards so that players can see the past Elements. Before removing the sleep mask, the Dreamer recounts their dream and tries to mention all the Elements they guessed during the night. For example: "In my dream, I saw a ROOSTER who fought against a VAMPIRE fora HAMBURGER while a DOG was playing DRUMS"
When the Dreamer has finished recounting their dream, they remove the sleep mask. Clarification: As the Dreamer mentions the cards of their dream, the other players can slightly rotate the Dream cards to help during scoring. Fairies score 1 point for each Dream card on the Yellow side of the board (correct answers). Boogeymen score 1 point for each Dream card on the Blue side of the board (wrong and/or skipped answers). 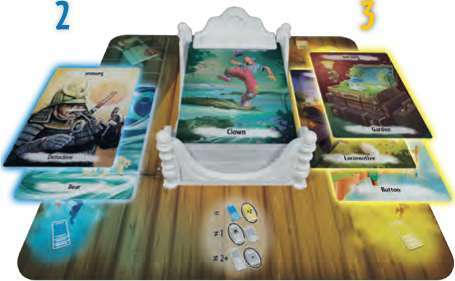 The Dreamer scores 1 point for each Dream card on the Yellow side of the board. They also score 2 extra points if they mentioned all the Elements placed on the Yellow side of the board when recounting the dream. Example: Lisa and Eve are Fairies, they score 3points. Tom is the Dreamer, he scores 5points because he remem- bered all of the Elements (3+2). Amy and Melissa are Boogeymen, they score 2 points each. Jack is a Sandman, he scores 3points. Remove all of the Dream cards from the board and place them at the bottom of the deck (making sure to rotate and/or flip the cards). The player sitting to the left of the Dreamer becomes next round's Dreamer. They take the sleep mask and all of the Dream Spirit cards, including the one that was set aside. When all the players have been the Dreamer once, the game ends. Each player counts their points, remembering to subtract one point for each penalty they have in front of themselves. The player with the most points wins the game. In case of a tie, the tied player with the fewest penalties is the winner. If there is still a tie, the players share the victory.